Oh, the halfway point. That sweet (arbitrary) line allowing us to refer back to this season’s 1st half or 2nd half. More importantly, it’s time to reveal the BABS All-Stars! This list will not address the Freddie Freemans and Nolan Arenados. We are more interested in the black swan types. Guys who seemingly emerged from the mist to help carry owners to fantasy supremacy. Let’s dispense with the pleasantries, and get right to it. Jacob Realmuto (p,A+) and Yadier Molina (p,AV) make the cut. Very little to say here. This position is a barren wasteland. The savior of many fantasy teams, Jesus Aguilar (P+,A+) has powered his way to the top of HR leaderboards. BABS is thoroughly impressed. Hard to believe anyone saw this coming. Aguilar’s NFBC ADP was 478! We should note that BABS liked his power (P+) at draft time. Brandon Belt’s ADP (301) was flummoxing. We knew (thanks BABS) he was one of the juiciest late round targets in the draft (P+,a). Belt’s half-season (PW,s,AV) has been backed by healthy counting stats. With physical health, he should continue to produce. Max Muncy (P+,a) and Mitch Moreland (M,PW,AV) also deserve consideration. Maybe the most exciting player in baseball, has Javier Baez (PW,S+,AV) finally unlocked his immense talent? BABS certainly thinks so. El Mago is angling to pull off his greatest trick yet, a first round return on an ADP 105 investment. If BABS and Javy himself are to be believed, expect more of the same in the second half. The name Gleyber Torres (PW,AV) might make forgetful Cubs fans cringe. He has made many fantasy owners gleeful. The Torres hype train arrived in The Bronx and has been a runaway success. Gleyber’s 328 ADP was indicative of his playing time uncertainty, not his talent. Those who were able to draft and hold have been handsomely rewarded. At 34 years old, Jed is not dead, baby. Mr. Lowrie (p,AV) has found the fountain of youth, and in it was power! At press time, Lowrie (ADP 429) already equaled his career high with 16 HR. BABS and yours truly are proud place the honorific after his name: Jed Lowrie, BABS All-Star. Snubs: Scooter Gennett (p,A+) and Ozzie Albies (p,AV). Late round hits don’t get much better than 2018’s Eugenio Suarez (ADP 186). Despite missing two weeks in April, Suarez (PW,s,AV) leads the NL in RBI. He has continued his year over year skills consolidation by improving his contact rate and power indicators. The .300 BA is new and skill-supported. The youth movement in The Bronx has many faces (see above). Miguel Andujar (p,s,AV) has flashed skills good enough to relegate MLB veterans Neil Walker and Brandon Drury to bench roles. Rookies can be difficult to trust, but BABS thinks Miguel has a chance to continue his success. Also rans: Eduardo Escobar (PW,AV), Derek Dietrich (p,a), and Jeimer Candelario (p,s). Charlie Blackmon and Nolan Arenado were top 10 picks. They play at Coors Field. 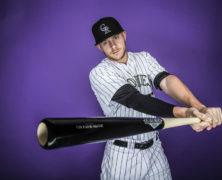 Why was Trevor Story (P+,s,a) all the way down at ADP 113? Recency bias. There can be no other explanation. Safe to say BABS and every fantasy owner will be targeting Trevor (pitctured) early and often next season. Good chance if Story is your starting SS you are sitting pretty in the standings. Long a wizard with the glove, Brandon Crawford’s (p,A+) bat has been equal to his defensive excellence. Crawford (ADP 365) has ridden a jump in line drive rate to a career high BABIP, thus elevating his BA. Injuries and ineffectiveness thinned an already shallow position, and Brandon was there to provide a soft landing. Steady, boring production is an undervalued asset. Missed the cut: Andrelton Simmons (s,A+) and Asdrubal Cabrera (p,AV). After the Braves dumped his salary in the off-season, Matt Kemp (PW,AV) was seemingly left for dead (ADP 305). Kemp did some dumping of his own, as in a ton of weight. Matt can thank a BABIP reminiscent of his salad days in the early twenty-teens for his BA surge. Though a recent slump may have dulled his luster, BABS sees enough to award Kemp a spot. Those who saw this know that no BABS All-Star team would be complete without Brandon Nimmo (PW,S+,a). Brandon’s skills translate into BABS assets approximating a poor man’s Betts, Pollock or Benintendi. Nimmo is set to play plenty in the 2nd hal. If BABS is right, his counting stats should follow. Some of us were worried after a rough first month. Eddie Rosario (PW,AV) put those worries to sleep with a tremendous May-June run. A two-month OPS over a thousand to go along with 15 HR, 40 RBI and 4 SB. Presently a $30 player, Rosario (ADP 125) has earned his way to the top of every fantasy outfield. Keep riding him. I recently wrote about pitchers. So, from the Department of Redundancy Department, here are your BABS All-Stars from the pitching ranks. Ross Stripling (E+,KK) ADP 495! If I did not cover your favorite pitcher, Chris Doyle certainly did. Come this weekend, the first half will be officially behind us. The dog days are coming. BABS will come with updates to see us through. I saw that BABS still has a favorable projection for Luis Castillo, should I hold him for that reason, or is dropping him for Tyson Ross or Mike Montgomery maybe not the worst adjustment at this point? I mean, at what point do we say that despite his skills, there must be something lost in translating them to a baseball field? I’ve been patient, but it isn’t mid-May anymore. BABS ratings are not projections, they are evaluations of current performance. Castillo’s “EX”perience liability always kept open the chance of a wide range of possible outcomes around his skill set. Your decision depends upon the depth of your league and where you are in the standings. If it was me, Castillo is not the type of talent I would replace with either of those two far lesser-skilled players. Castillo is the type who could right himself at any time and go on a 10-start 2.00 ERA run. Not projecting, just speculating within that range of possible outcomes. Thanks for the reply. It’s an SP spot in an NL league so good options are scarce. I’m in the middle of the pack, and will hold Castillo and hope that a healthy Syndergaard and Strasburg will boost my 2nd half. I was frustrated seeing the allstars, when I considered how the cost of Stripling was so much less than Castillo, but I just have to get over it, appreciate that I still have a decent chance and manage on from here.